Bay Cottage in Boughton, near Downham Market, Norfolk sleeps 2 people. Bay Cottage near Downham Market has been superbly renovated by the owner, who lives next door, to provide spacious and comfortable holiday accommodation, with the additional benefit of a wood-fired hot tub. 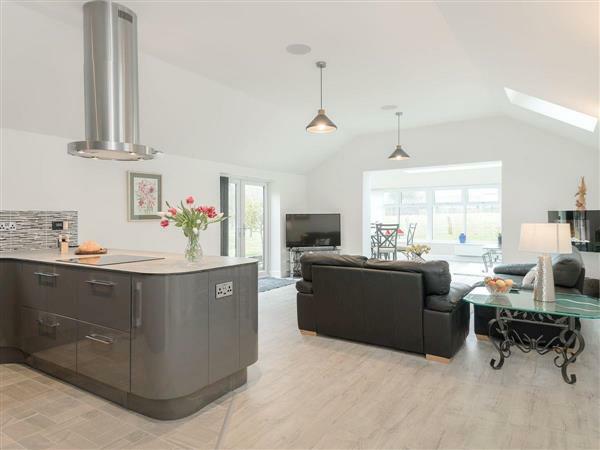 This detached annexe is situated in the rural village of Boughton, close to the large village pond with its ducks, and there is plenty to see and do throughout this area of west Norfolk. The moated manor house of Oxborough Hall is nearby, as are the Fens, Ely and the Royal Estate at Sandringham, which is 37 miles away and is regularly used by the Royal family. To the south, lies Ely, with its cathedral, Saturday market, array of gift shops and a pretty waterfront with boat hire. The Pensthorpe Nature Reserve and the Thursford Collection are nearby, and King’s Lynn also offers an excellent day out, with its medieval buildings including the churches and Guild Hall, as well as the 17th-century Custom House. For the more energetic, there are many walks and cycle routes throughout this area. The beach is 25 miles from Bay Cottage near Downham Market. With the shop 1½ miles, and the pub & restaurant are 2 miles from Bay Cottage. Living area: With 49 Freeview Smart TV, DVD player, DAB radio, Bluetooth music system, wooden floor and French doors leading to courtyard. Bedroom: With four poster super king-size bed, 32 Freeview Smart TV, DVD player and en-suite with bath, walk-in shower, toilet and heated towel rail. Electric central heating, electricity, bed linen, towels and Wi-Fi included. Welcome pack. Enclosed lawned garden with courtyard, garden furniture and barbecue. Wood-fired hot tub for 4 (private). Private parking for 2 cars. No smoking. Holidays at Bay Cottage run from Friday to Friday. For a better idea of where Bay Cottage is, you can see Bay Cottage on the map below. Bay Cottage is in Norfolk; should you be on the lookout for a special offer, you can find all the special offers in Norfolk. It's always worth checking to see what is on offer at the moment. Do you want to holiday near Bay Cottage (UKC2726), you can see other cottages within 25 miles of Bay Cottage; have a look to find your perfect holiday location.